A recent report from JLL concluded that while office demand in the Thames Valley has increased by 60% during 2014; the volume of actual office deals completed has remained subdued, suggesting that there is likely to be a surge of deals in late 2014 and early 2015. While some 3m sq ft of office space was let in 2013, only a modest 800,000 sq ft has been let so far in the first three quarters of 2014. Only one deal over 50,000 sq ft was signed VM Ware’s acquisition in Staines (62,000 sq ft). Other major deals included Avnet moving to The Capitol Building, Bracknell (42,500 sq ft), Pernod Ricard taking space at 12 Chiswick Park (42,000 sq ft) and UK TV’s relocation 10 Hammersmith Grove (32,500 sq ft). JLL say that with over 60% of current requirements in the area coming from US companies, that there is a trend for real estate decisions by US companies to be taken at the end of the year, suggesting a clutch of deals to come. JLL is now forecasting nearly 2m sq ft of office deals in the Thames Valley in the final quarter of the year. Metropolis’ own database of Thames Valley searches reveals about 50 outstanding, including 40 new ones added this year. 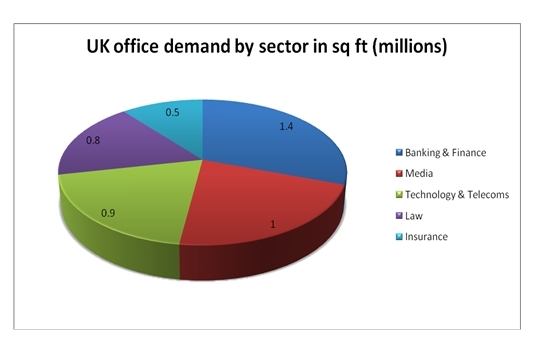 There is some 4.8m sq ft of identified office demand in the Thames Valley including large companies searching such as Pepsi, Boden, Ocado and Amadeus. There is also a solid batch of mid size requirements driven by forthcoming lease expiries and expansion plans. Hammersmith, Chiswick and Bracknell are currently the most popular areas for office deals so far in 2014, under JLL’s definition of Thames Valley. 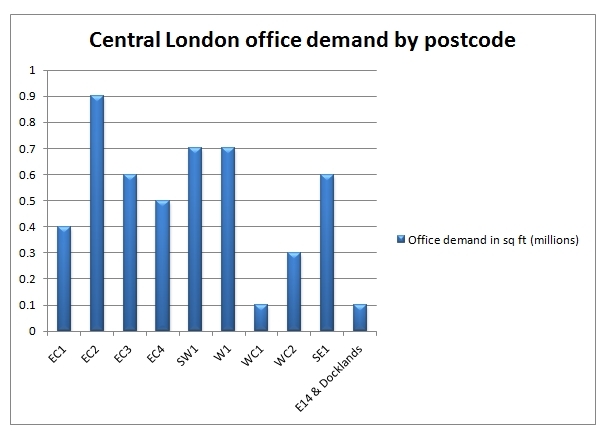 There is around 1.6m sq ft of new office space under construction in the wider area Western corridor area. The area is due to deliver schemes in Chiswick, Slough and Reading, where four schemes are due to deliver nearly 400,000 sq ft, which could prompt some high profile moves to the town. Sometimes you can’t fault companies for their optimism. Metropolis spoke to the owner of one central London building who confirmed that the building would be demolished the following year. Metropolis then spoke to 8 of the 9 tenants who confirmed they were searching or about to search for alternative premises. Initially the junior staff and the 9th firm accepted they would be moving, but despite repeated attempts Metropolis was unable to speak to the office manager. The firm, based on the 2nd floor of the condemned building, was eventually run as a lead, whereupon the evasive office manager complained that he had no had no intention of moving and would renew his lease regardless of the planned demolition. One company asked if the company could get someone to call the researcher back. The researcher replied that would be fine and to ask for ‘Sam’. “How do you spell that?” was the follow up question… ‘S’…’A’.. Reasonable question. When asking one company: who deals with its office, one receptionist said “oh thats Mr Briggs, he’s the caretaker and he changes the loo rolls and everything.” Ok let me put that another way.. Temporary staff are often poorly briefed by the company for whom they are working. Researchers will outline why they are calling and ask to speak to the office manager. The Temp will say “do you have a name?” The researcher will say “I was hoping you could tell me.” To which the temp will say “I don’t know anyone’s names or job titles here I’m just the temp”. I’m guessing that the company’s phones were unusually quiet that morning. A recent report by CBRE suggested that a rise in the number of office deals in Belfast is approaching, as a number of occupiers look to secure more space. Belfast office lettings in the first half of 2014 barely reached 100,000 sq ft in just over 20 transactions. This total was less than half the 200,000 sq ft of office deals that were signed in the second half of 2013 in the city. Recent lettings have included office space being taken by Deloitte, Cowen Financial, Scottish and Southern Energy, Grant Thornton and Herbert Smith Freehills. Meanwhile the British Council and Pharmalink Consulting have agreed moves to ‘The Boat’ office building. However, news of recent job creation by Alexander Mann, PricewaterhouseCoopers, Options, WAVTEQ, CVS Caremark and Spence and Partners, amongst others suggests more demand for new and expanded office space to come. Metropolis has spoken to these companies and a raft of plans to take more office space in the city have been revealed (details on our database). There are high profile searches ongoing from accountancy firms EY and Deloitte who both require up to 60,000 sq ft of office space; as well as office space requirements from companies such as Concentrix, Capita and Proofpoint. There are also a lot of sub-10,000 sq ft potential movers, as well as continuing investment from a number of US-based companies and a number of UK companies looking to set up lower cost regional operations. The largest office scheme under construction is the 68,000 sq ft speculative City Quays scheme; while the 150,000 sq ft Olympic Building has gained consent and the 124,000 sq ft City Quays 2 building is at application stage.